Care homes have in the past been considered career backwaters, places to go when you are nearing the end of your NHS career. But that is changing across the UK, with care homes increasingly viewed as modern, vibrant places to work. This is particularly evident in Scotland, where the charity Erskine provides a clear career structure for staff that can take them from care assistant to nurse consultant. 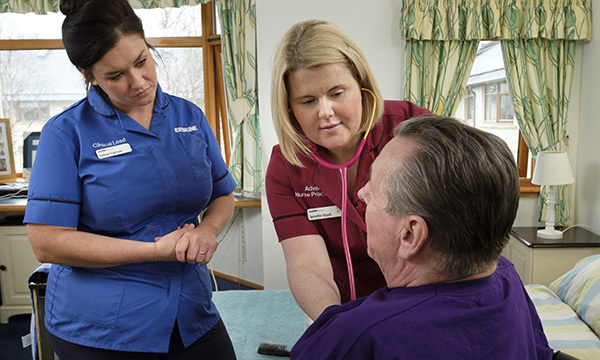 Erskine provides nursing, residential, respite and dementia care to UK veterans and their spouses in four homes across Scotland, and is believed to be the first in the UK to employ an advanced nurse practitioner (ANP) in a care home. I took up the post in February 2017 and am based in the Erskine care home in Glasgow. My role is to ensure residents receive the highest standard of person- and relationship-centred care, and ensure they have access to rapid assessment and treatment where necessary. I am also a qualified non-medical prescriber and am part way through my master’s degree in advanced clinical practice. As well as being beneficial to residents, employing an ANP reduces reliance on GP surgeries, reducing the workload of GPs. Since I have been in post, GP visits and unnecessary hospital admissions have reduced. In April 2017, a dementia nurse consultant was also employed at the Glasgow care home. She is an expert in caring for people with dementia, and supports and educates staff to ensure they gain the necessary knowledge and skills to deliver high-quality care. The dementia nurse consultant delivers training to all staff, including simulation training on age and frailty within our customised cottage setting. Residents often have complex, multiple health conditions, and nurses who work in our care homes need to be able to recognise when a resident’s condition is deteriorating. Nurses have to rely more on their own clinical judgements in care home settings than they would on a ward. Training provided by the dementia nurse consultant encourages staff to ‘think delirium’ when a resident’s behaviour or presentation differs. If a resident becomes unwell, the nurse uses the 4AT assessment test for delirium and cognitive impairment to assist in early detection of delirium. If a resident scores four or more in the test, I will be called to complete a further assessment and will liaise with the dementia nurse consultant to discuss any concerns around dementia and delirium. I then decide on a treatment plan and liaise with the GP if necessary. Having both an ANP and dementia nurse consultant enables us to adopt an early intervention model. Residents are assessed, diagnosed and treated within the home setting, leading to a more positive experience for residents and their families. Educating staff is a huge part of both our jobs. Rather than adopting a ‘doing for’ approach, which can de-skill staff, we support staff to increase their knowledge and skills. I will become involved in a resident’s care if necessary, but our nurses are trained to carry out initial assessments – it is all about working as a team to ensure our residents receive timely, quality care. We have a number of newly qualified nurses who choose to begin their career with us. When asked why they chose this path, they say they want to gain experience and knowledge in a field with high expectations and excellent support and training. Working in an environment where residents’ care is at the heart of any decision making gives me a massive sense of job satisfaction – we see it as working in their home, not them living where we work. I have also had opportunities I most likely would not have had in the NHS. Working in the care home setting is not just a job, it is a career. Jennifer Boyd is advanced nurse practitioner at Erskine Care Home in Glasgow, Scotland. She will be presenting a seminar on nursing opportunities in care homes at the RCNi Nursing and careers Jobs Fair in Glasgow on 13 June.